This is a really interesting business. Stay Vocal rescues used t-shirts by turning them inside out and printing on them and reselling them. That’s a great idea! The t-shirts that can’t be rescued whole get cut up and hemmed for handkerchiefs. I’ve been wondering a lot lately about what to do with old clothes that are not really wearable anymore. I think patchwork needs to come back into fashion. 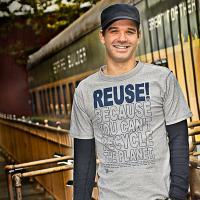 STAY VOCAL: ReUse Apparel. Because You Can't Recycle The Planet.. Thanks for sharing my brand and that picture of me! Just an FYI, I’m standing by Empire Coffee, which is a coffee shop set inside an old train car in Chico, CA. Good stuff. Love this! It is our mission this year as a family to reuse as much of our old and outdated clothing we have and donate the rest.Cant wait to show my girls this! fabulous!! !